With God’s Grace providing hope and showing love to our families at our Huber Heights mobile locations. Today weather was sweltering outside With God’s Grace provided 157 families with healthy meals for dinner tonight. This afternoon our dedicated 15 volunteers, were a blessing to many families in our community. With God’s Grace, is so thankful for your dedication to helping fight hunger in our community and show our families you care. On a rainy day, umbrellas provided little shelter to families waiting in line to receive food from With God’s Grace. Patiently, soaked and tired families came in one by one to fill their boxes with food. This afternoon 119 families received bags of potatoes, Onions, 8 packages of Fresh Produce that they got to pick out. Unlimited item from the free box of produce. 2 items from Dairy and cooler items ( our families get to pick out), 1 bakery( our families get to pick out), 3 breads ( our families get to pick out), and 14 non-perishable food items. With God’s Grace would like to thank our donors for making today event possible. Every $1.00 you donate help buy 4 meals for the local community. With God’s Grace would like to thank our panter Onelove Church and all of our volunteers for coming out today to fight hunger in our community. Celebrating Cinco De Mayo fighting hunger in Huber Heights at our one of partner locations The Y at The Heights. With God’s Grace would like to thank Dorothy Lane Market for providing the milk, cooler items Bakery, and Bread for today’s mobile. 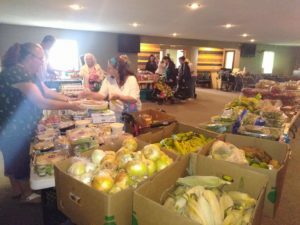 With God’s Grace would also like to thank Foodbank Dayton for opening up today for us to get fresh produce for our families. This afternoon 363 people received healthy food for dinner. 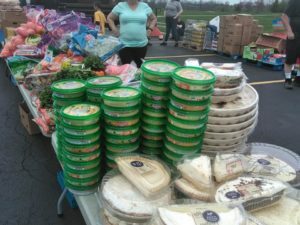 We blessed to announced 133 families received 5 choices of cooler items, 3 gallons of milk, 5 cheese products, 5 choices of produce items 5 bread items, 2 bakery items and 10 non-perishable food items. With God’s Grace would like to thank the 20 volunteers for coming out and fighting hunger in our community. IT’S St. Patrick Day and were blessing our families with fresh green lettuce at our Onelove Church mobile in Huber Heights. Today 403 people received 3,326 meals for their families. Our families received 6 boxes Whole Eggs with Citric Acid, onions, lettuce, strawberries and a wide selection of fresh assortment produce, bread, bakery, and non-perishable food items. This evening 127 families have healthy meals for dinner tonight. With God’s Grace would like to thank our 32 volunteers for coming out to fight hunger in our community.